And with the wind the trees doth creak and moan. As coat of ice doth shiver, shake and groan. As Mother Nature weeps for what she’s lost. Their innocence, as e’er, too high a cost. And come to terms with this we children must. But none of us are guaranteed to heaven. I’ve started a new journal. As I am inclined to do, I flipped through the pages of my last journal to see what I’d left behind and found this sonnet written during the great ice storm of Christmas week December 2013. Written by candlelight, I imagine. I don’t remember. That week is such a blur. Surreal, I suppose. 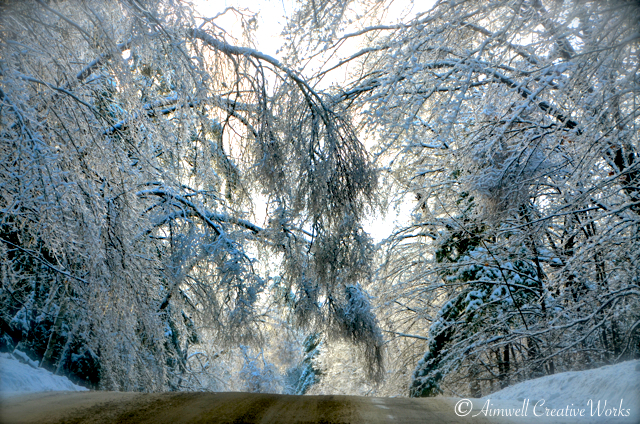 I love trees and it distressed me to see them suffer under the volume of ice they bore. Now, two months later, the only ice left is under foot, and this is a hazard all its own. Perhaps a month from now the view will be green instead of white. Judging by the mountains of snow and three inches of ice underneath it, spring could be a long way away … and messy. Still, snow can be so pretty. 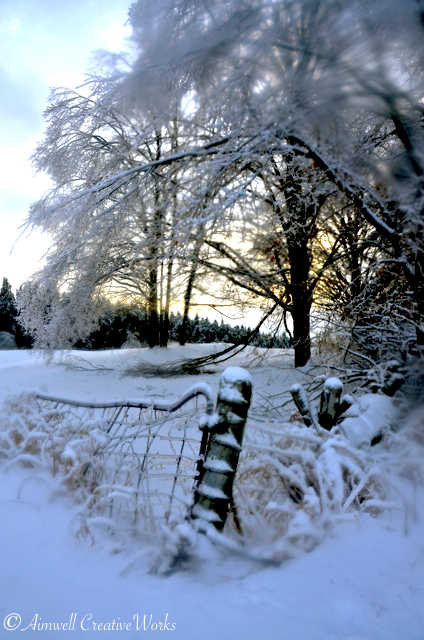 This entry was posted in Canada, Landscapes, Life, Nature, Photography, Poetry, Uncategorized, Writing and tagged Aimwell CreativeWorks, Dorothy Chiotti, ice storm, landscape, Mother Nature, Ontario, Photography, poetry, snow, sonnet, spring, storm, trees, Weather, winter, writing. Bookmark the permalink.